Your hotel’s online traffic and online bookings come from a broad variety of sources today, and none of those sources is more important than search. 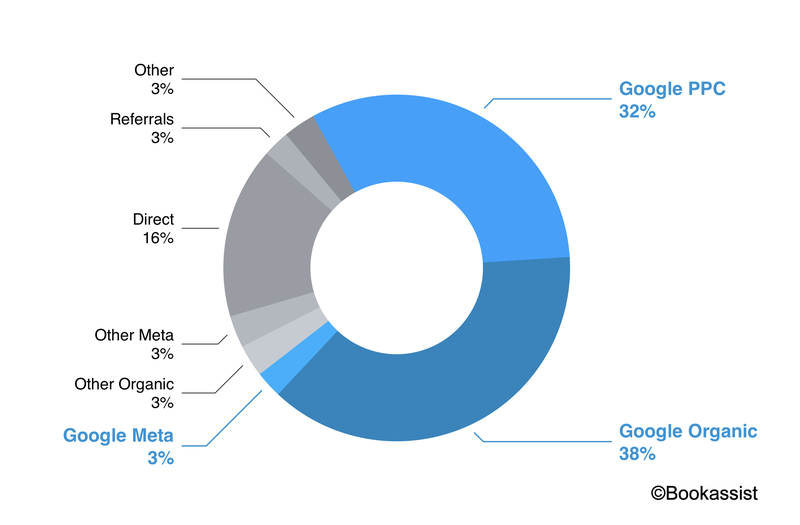 Aggregated data from hundreds of Bookassist partner hotels across Ireland and Europe over the past 12 months show that Google was responsible for 72.5% of overall traffic to those clients when you add Google pay per click (PPC), Google organic search and Google meta search (see Figure 1). Google continues to rank far ahead of all other search engines in market share terms. This is particularly true when it comes to mobile where its dominance of search volume currently exceeds 90% due to its ownership of the Android platform and its status as default search on Apple’s iOS. With Google processing over 40,000 search queries every second on average, it’s virtually impossible for your business to succeed online without prioritising Google in your online strategy. Just think of what could be achieved if you could own your very own real estate on Google’s search engine results page (SERP). Well actually you already do have a foothold - although there is a massive performance gap between brands that dominate the whole SERP area and those who just own a small corner. In a perfect online world, when someone searches for your brand on Google, the results page would be heavily dominated by you, the brand owner, with perfect messaging that reels in the customers. It’s not that easy to do, but those that do get it right reap large economic benefits. The continuing cost of tackling the issue can well be outweighed by the ongoing benefits if you get this right. Presence on the first page of Google’s SERP is the holy grail for brand owners and marketeers. However it is not enough - you need to be present and strong across all areas of the first page. Search engine optimisation (SEO), PPC, Google My Business and metasearch are all separate areas that must be continually optimised to present an enticing storefront for potential customers. And just like any store front, the windows need to be appropriately dressed and targeting to the customer. Hoteliers actually have a lot of control over the presentation of their brand on the SERP but disappointingly many allow the weeds to grow and the page goes unnurtured and overgrown by unwanted competitors. So what can you do to win at the online equivalent of the Chelsea Flower Show? Firstly it is important to understand the key areas of the Google SERP to see why and how they can be influenced for maximum visibility. It is interesting to note that 34% of searches on Google do not result in a click – this is because Google has either answered the query directly on the page, or because the user was not satisfied with the results and so entered another query. Starting at the top of the page, the easiest area to control is the section with PPC or paid ads, which can be identified by the small green text box which says ‘Ad’ (see Figure 2). In order to maximize visibility in this area it is strongly advised to use a Google Premier Partner like Bookassist that has experience in creating and optimizing campaigns for hotels. Your agency should ensure that the full complement of ad extensions and sitelinks are used to maximize the footprint on the page and provide rich information, and to ensure the best position to get maximum click-through. The devil is in the detail here and significant skill is needed for research and optimisation. Many hoteliers query the value of running brand name ads at all. But there are significant implications of not doing so. In conjunction with one of our partner hotels we ran an experiment to see what impact turning off brand ads would have on other areas of Google search. 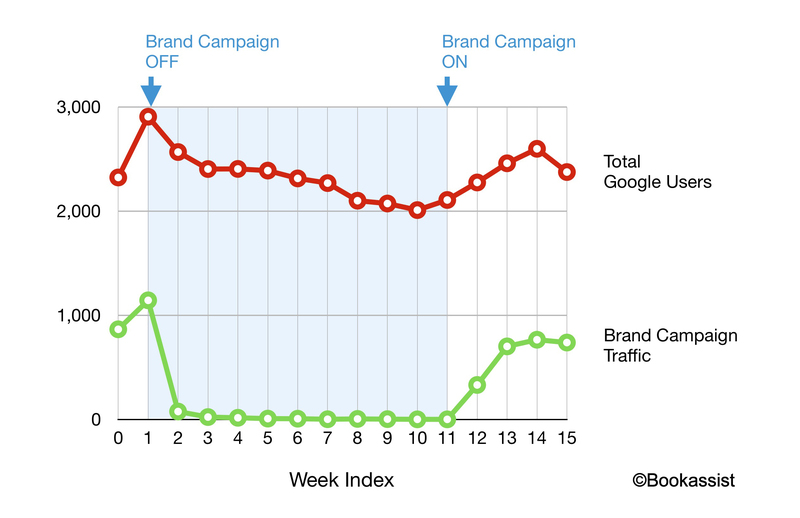 As is demonstrated in Figure 3 below, there was a significant drop in OVERALL Google traffic when the brand ads stopped, with a recovery as soon as the ads were switched back on. Our conclusion was that while PPC ads will divert some users away for clicking on organic listings, removing the ads will result in an overall traffic drop as users click on alternative ads. Continuing down the SERP to the organic results listing beneath the PPC ads, it is important that this area too is managed by an agency experienced in SEO. Technical areas such as meta tags and descriptions need to be expertly crafted to send the best possible message to Google but also to attract users and encourage them to click through to your site. And of course you need to consider multilingual approaches also for your target markets which may differ in approach and not be simply translations of the main language. 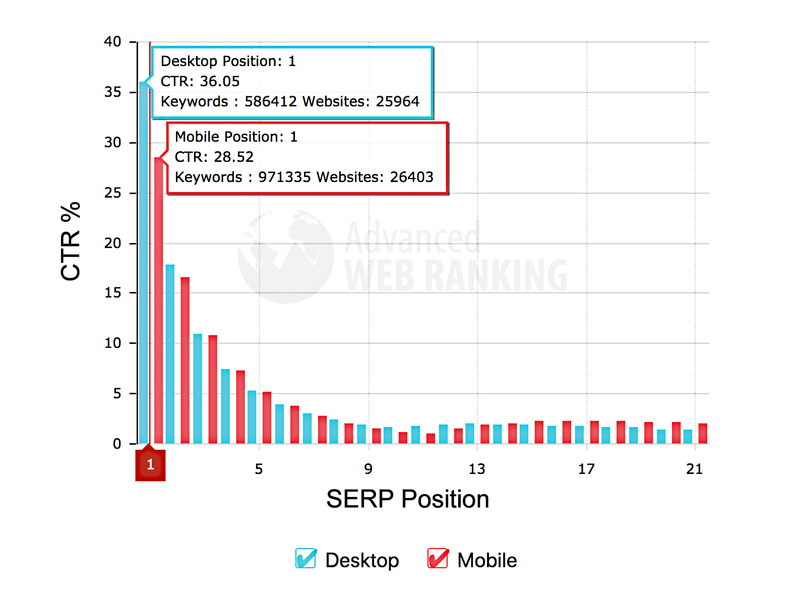 Data for Google organic traffic in March from Advanced Web Ranking shows that, internationally, the first listing in the organic results page receives a 36% click through rate (CTR) on desktop and 28.5% CTR on mobile with a rapid drop off as we move down the SERP (see Figure 4). So it is critical to focus on how to rank first for your brand name. The third key area of the results page appears on the right hand side and is referred to as the Knowledge Graph by Google. The objective of this section is to answer as many queries as possible in one area and to encourage the user to click through to a booking facility powered by Google Hotel ads – Google’s metasearch advertising platform. Looking at a well-structured example in Figure 5, we see the various areas that can mostly be optimized directly by the property owner. If you don’t already own the information being displayed about your property, the first step is to claim the business using Google My Business at the address business.google.com. The Google My Business interface allows you to manage photos, reviews, description, questions and much more. When logged in to your Google My Business account, you can upload official property photos and review user photos in order to flag any that are unsuitable. It is important to note that the knowledge graph will appear for searchers whether you engage with it or not, and in the absence of owner-supplied information, Google will rely on general users and third party websites for content. The next key area to check is the map, to ensure that the location is correct, and following that, to check that the name, address and phone number match exactly with the details on your website. The Book a Room button and Check Availability facility are powered by Google Hotel Ads. Google’s metasearch service that operates on a cost per click model. Again if you are not there, the user will likely click on a third party to check rates and complete a booking. Use of this area requires partnership with a metasearch provider such as Bookassist that has a certified connection to the Google Hotel Ads platform. The Hotels details section allows you to create a well written and informative description of your property but unfortunately Google frequently ignores this description and pulls one together from various sources across the web. Despite this drawback it is well worthwhile managing your description and taking the time to regularly update your amenities to ensure that they are 100% accurate, as having incorrect facilities listed can lead to customer dissatisfaction on arrival or possibly mean missing out on a booking when customers don’t see a facility that they require. The final two sections require regular monitoring and feedback – firstly the customer reviews should be treated in the same way as other important review sites, with frequent responses from the owner or other responsible for both good and bad reviews. Finally the questions and answers section is a good opportunity to engage with customers. These questions are typically answered by Google users, so it is important that the official response is given for accuracy, but also to start a conversation with customers. You may not know it, but you already have a SERP for your hotel. The question is who really owns that real estate, you or your competitors? It’s time to move your page’s real estate from a side alleyway to the main street and tap into customer demand. Ciarán Rowe is Head of Digital Marketing Operations, Claire Sawier is Head of Marketing, and Des O’Mahony is CEO & Founder at Bookassist (http://www.bookassist.com), the multi-award-winning technology and digital strategy partner for hotels worldwide. Bookassist is The Direct Booking Expert™ and is a Google Premium Partner.